David Cobb (1921-2014). Oil on board, signed David Cobb and dated "90". David Cobb, a well known authority on HM MTBs and who himself spent time in Coastal Forces, has painted a superb action picture of three of these pucky little craft manoeuvring at speed, the enemy's starshell illuminating them and searchlights too sweeping for them. 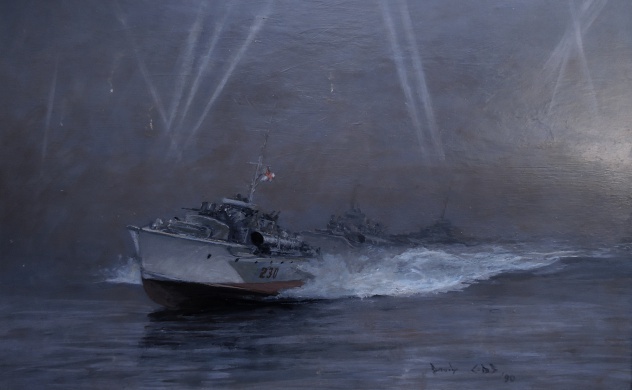 The boats are again in action and this scene could have come straight from the narrative of Peter Scott's "The Battle of the Narrow Seas", Peter Dickens' "Night Action" or Robert Hitchens' "We fought them in Gunboats" (for he commanded MTBs before moving to MGBs). A wonderful picture painted by a master of fast small boats and far flung washes and wakes, and a pair to another by Cobb of MGB G83, also on this website.